Something is going bump in the night at Villa Rica’s Pine Mountain Gold Museum. 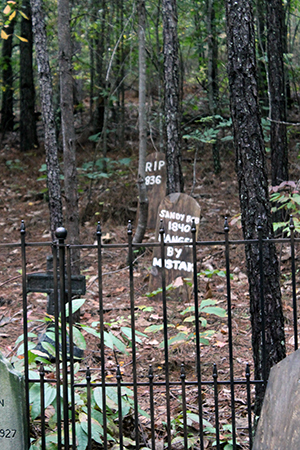 As the third year of the Ghost Train kicks off, the woods around the tracks of the train are fully decorated with props and animatronics. The haunted attraction runs a Halloween themed family-friendly ride that starts at 5p.m. 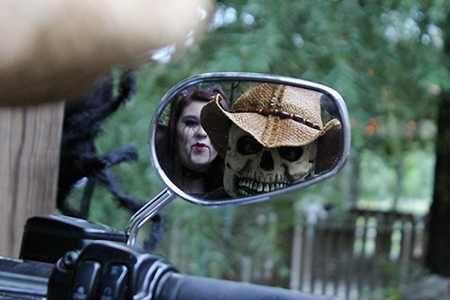 After 7:30 p.m., a scarier ride is promised. During the earlier ride, scary special effects and creatures are covered. “Actors and creatures in line or on the tracks will be friendly and will wave at the guests coming by,” said Linda Shaw, the museum manager at Pine Mountain Gold Museum. The “scare-time” ride begins just as night begins to fall, setting the best atmosphere for their scary effects. “All of the props will be uncovered, the fog and chiller machines will be in full force,” said Shaw. 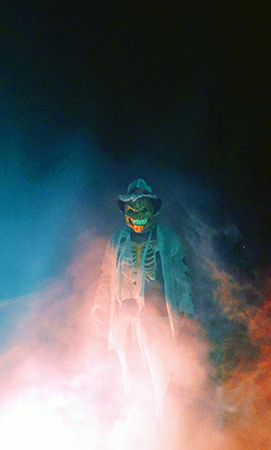 The ride features several traditional Halloween creatures, such as the Headless Horseman, a wizard, ghosts, zombie miners, clowns, scarecrows and many others. To add to the scare factor, all the actors become more aggressive. They jump out of the woods, run at the train and even run alongside of the train. Upon arriving, patrons are instructed to walk through a gate into the woods, where a skull-headed biker greets them and a giant clown holding a meat hook. A photo booth is set up at the entrance to allow patrons a photo opportunity with these two characters. From the photo booth, guests cross over a bridge, walking even deeper into the woods to the ride. While walking, guests can expect to have the actors interact with them. Passengers are then ushered into a small wooden shack where an old man introduces everyone to his friend “Oscar,” a skeleton in a rocking chair. Oscar tells the story of the Ghost Train and warns everyone of the forboding doom waiting ahead on the tracks. While passengers board the train, actors with the attraction do, too, and they scream and cackle throughout the haunted journey. Shaw explained that the community has approved of the Ghost Train, which has allowed them to continue to improve and expand the storyline of the ride. “This year, we are adding in a theme reminiscent of the Sleepy Hollow tales, with a wizard who raised a headless horseman from his grave on the mountain,” she said. The Pine Mountain museum plans to continue holding the attraction in the future.